FINALLY THE HOODIES HAVE ARRIVED! \o/ ....now in white too! 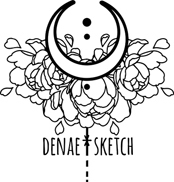 Limited edition denae*sketch Moonflower pullover hoodie and sweatshirts.